The 2 Micron size is more commonly used for aeration or oxygenation pre fermentation, but can be used to carbonate beer. If you wish to use an aquarium style Aeration Pump to pump air through this stone we recommend a "deep water" type for aquariums, as these will have the necessary PSI to force the air through the stone and into the wort. If you are looking for a ready to use package check out Complete Aeration System. Thank You! I liked the thread. However to really complete the set up they should also sell a 24" tube to match up with this. 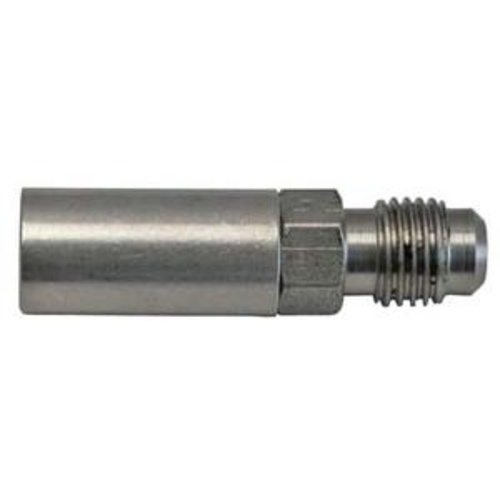 I've used one of these steel stones for years with the O2 bottle connector, and it's the best way to oxygenate wort/must that I've used to date. I just decided to get a spare. I let my old aeration stone grow mold (my fault). I purchased a new one and air leaks where the stone is attached to the flare threads. No air actually makes it through the stone. Morebeer was great and sent a free replacement. Last week I got my third free replacement and all three of them leak and are totally worthless. I commend morebeer for their customer service, they sent free replacements quickly and with zero hassle, but the product itself is flawed. I'm not sure if it's the current batch that has a manufacturing defect or what, but all three have just ended up in the trash. Now I'm stuck with an aeration system without an aeration stone. With these metal-to-metal flare connections you're supposed to use a nylon washer (Morebeer part KEG602). The connection will leak air without one. Great way to oxygenate wort! This stone works great. I turn on pure O2 for 30-60 seconds into the wort right before I pitch yeast. Has been working great for me. Clean it by boiling in water for about 10 minutes. I've owned two of these to use with my oxygenation system and if you take care of them, they'll work great. I boil my stones to sanitize and remove any wort that may be trapped. If you don't boil them and leave them wet, they can grow mold. So make sure to let them air-dry after boiling. But don't heat them dry! This will break down the glue that holds the stone to the MFL fitting cause it fall off. This happened to my first one. I have many of these, most are barbed. This however is my new go to. I love the fitting and ease of cleaning. They are made of very high quality. Definitely worth the money. The threaded end makes them simple to sanitize. I have really liked using this stone and love the threaded aspect. Easy to use. perfect for aerating the wort before I pitch the yeast. creates very fine bubbles - takes some "pressure" to get started.